Dekel Ben-Shitrit was weeding a garden of a home in the Moshav Yogev (a moshav is a cooperative farming community similar to a kibbutz only not collectively owned), when he spotted an object in the vegetation. It was a ring with what appeared to be a human figure on it. 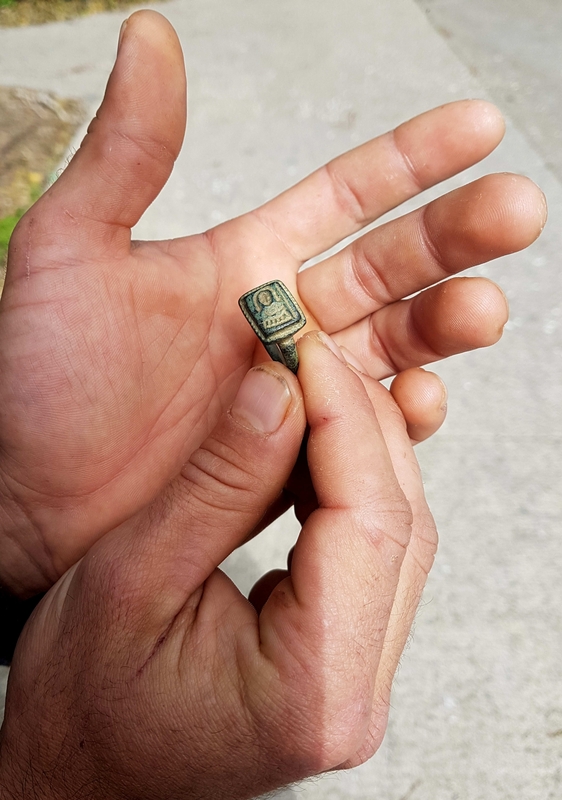 Curious to know more about it, Ben-Shitrit posted a picture on Facebook where it caught the eye of Dr. Dror Ben-Yosef, director of the Israel Nature and Park’s Authority Lower Galilee Education Center and his neighbor on the nearby Kibbutz Hazorea. Dr. Ben-Yosef recognized its advanced age and uniqueness and recommended he report the find to the Israel Antiquities Authority (IAA). The ring was examined by IAA Byzantine archaeology expert Dr. Yana Tchekhanovets whose preliminary identification indicates it is a representation of Saint Nicholas. The iconography of a haloed bald man wearing a mantle and holding a bishop’s staff points to him. It is a signet ring in excellent condition that makes a deep imprint that clearly shows the attributes of the Christian saint. Dr. Tchekhanovets dated the ring to between the 12th and 15th centuries. Crusader Jerusalem was conquered by the Islamic forces of Saladin in 1187, and the last Christian territory, Acre, fell in 1291. That broad date means the ring could have been crossing the Holy Land when it was under Christian or Muslim control. 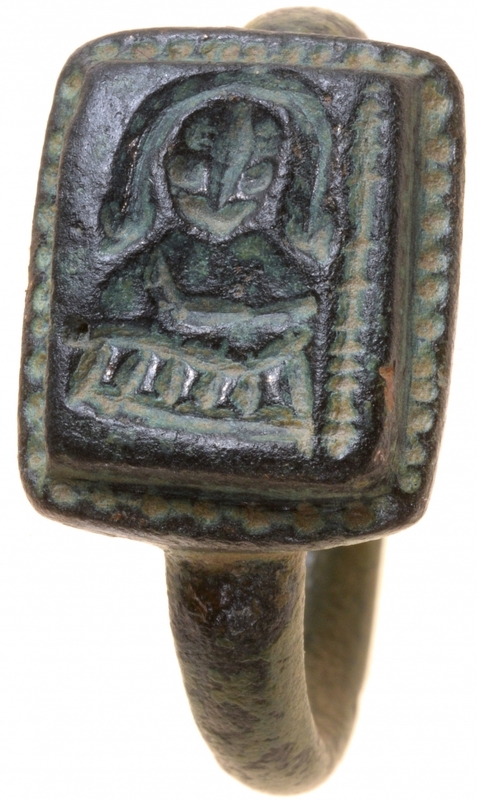 Obviously the figure depicted on the ring bares no relation to the Jolly Old Elf so associated with the contemporary tradition of Christmas gift-giving. The Saint Nicholas in the Eastern Orthodox tradition was more akin to the Western Saint Christopher, patron saint of all travelers, including merchants, sailors and pilgrims. Wearing a ring or medallion with his image — his attributes are the bishop’s crook and vestments — was meant to confer his protection on the wearer. The spot where the ring was found, in the Jezreel Valley just east of Megiddo near the Roman base of Legio, was a busy travel route for merchants, soldiers and pilgrims from antiquity onwards. It’s entirely possible that a medieval pilgrim lost his ring on his way to or from the coast. There’s no way of knowing for certain because the ring was not buried and found in situ during a rigorous archaeological excavation, but rather found nestled in weeds on the surface, so it probably wasn’t discovered where it fell hundreds of years ago. According to hagiographical lore, Saint Nicholas was himself a pilgrim to the Holy Land. Born to a wealthy Greek family in Lycia (modern-day Turkey), Nicholas was raised by an uncle who was an abbot and became a monk at a very young age. One of the earliest miracles he is said to have performed — predicting a storm at sea, praying it away, raising a sailor who had died in a fall from rigging — was when he was a young man on his first pilgrimage to walk in the footsteps of Jesus. He returned to the Holy Land when he was in 40s, joining a group of ascetic monks and living in a mountain cave outside Bethlehem for several years. When he emerged, he again made a pilgrimage to all the main sites of the gospel accounts. 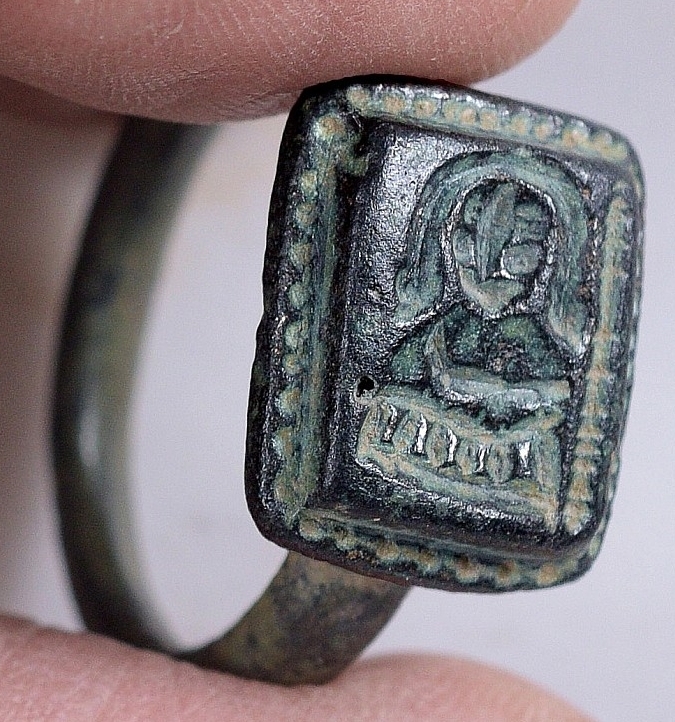 Pilgrims would carry his image with them even as they followed his example for many long centuries after Nicholas’ death in 343 A.D., but surviving pieces like this ring are very rare. They are easily overlooked, trafficked or kept by finders.